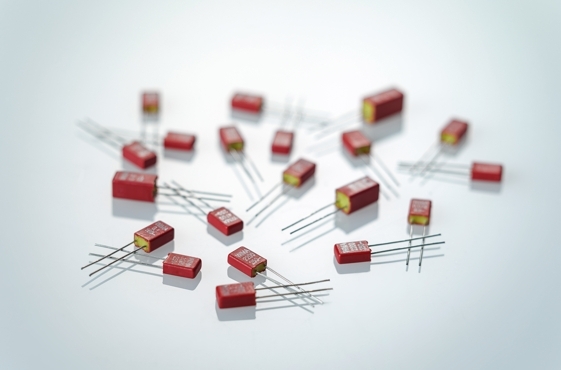 The realization of the smallest plastic film capacitors in the world has been made possible by the use of ultra-thin plastic film in thicknesses of 0.8 µm and below. The film processing with highly sensitive machines requires a high degree of experience and technical know-how. The WIMA series with 2.5 mm PCM are contacted at the end surfaces and have very low self-inductance due to the small pin spacing of the capacitor and its fully contacted electrodes. Furthermore, the pulse and current loading capacities basically increase, the smaller the PCM can be designed, because - provided that the thickness of the film is the same - a longer band length is needed to achieve a particular capacitance value. WIMA capacitors in PCM 2.5 mm are outstandingly suitable for HF decoupling in the field of high frequencies and open up new possibilities for use in applications with limited space requirements and high packing density. The values of the WIMA FKS 02 and WIMA FKM 02 ranges according to the WIMA main catalogue 2009 are still available on request. * Available subject to special enquiry.